Bhindy Bhujiya recipe by Rabia at DesiRecipes.com. Fry onions and zeera for 5 min. while stirring add tomatoes with salt and chilli powder stir for 15 mins. 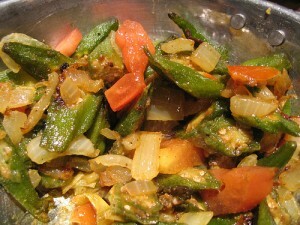 Add okra with imli and let stand on low heat for 15-20 min until cooked throughly.